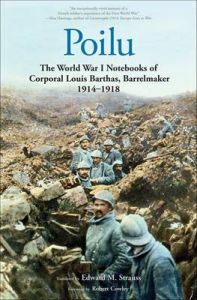 Along with millions of other Frenchmen, Louis Barthas, a thirty-five-year-old barrelmaker from a small wine-growing town, was conscripted to fight the Germans in the opening days of World War I. Corporal Barthas spent the next four years in near-ceaseless combat, wherever the French army fought its fiercest battles: Artois, Flanders, Champagne, Verdun, the Somme, the Argonne. Barthas' riveting wartime narrative, first published in France in 1978, presents the vivid, immediate experiences of a frontline soldier. This excellent new translation brings Barthas' wartime writings to English-language readers for the first time. His notebooks and letters represent the quintessential memoir of a "poilu," or "hairy one," as the untidy, unshaven French infantryman of the fighting trenches was familiarly known. Upon Barthas' return home in 1919, he painstakingly transcribed his day-to-day writings into nineteen notebooks, preserving not only his own story but also the larger story of the unnumbered soldiers who never returned. Recounting bloody battles and endless exhaustion, the deaths of comrades, the infuriating incompetence and tyranny of his own officers, Barthas also describes spontaneous acts of camaraderie between French poilus and their German foes in trenches just a few paces apart. An eloquent witness and keen observer, Barthas takes his readers directly into the heart of the Great War. Louis Barthas (1879-1952) was a cooper in a small town in southern France. Edward M. Strauss is a fundraising director in higher education and former publisher of MHQ: The Quarterly Journal of Military History. He lives in New York City.